Cebu Pacific celebrates its 10th Anniversary of Davao being its Mindanao hub with a media event last April 18, 2018 held at Rekado Restaurant. In 2008, Cebu Pacific designated the Davao City International Airport as its hub in Mindanao—and to this day, remains its largest in the region, with direct connections to Tagbilaran, Bacolod, Cagayan de Oro, Cebu, Dumaguete, Iloilo, Manila, Tacloban and Zamboanga; as well as Singapore. Davao is one of the pioneer routes of Cebu Pacific, with the maiden Manila-Davao-Manila service in 1996. 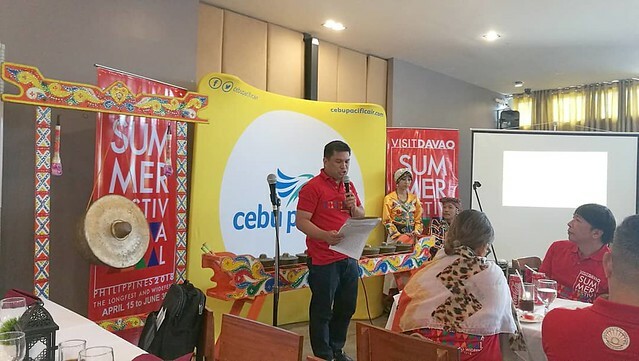 During the recent event here in Davao, CebPac have also renewed their partnership with VDSF for the fifth year of Visit Davao Summer Festival this 2018. Mr. Rene Lizada, VDSF Chair and Ms. Charo Logarta Lagamon of Cebu Pacific signed and renewed their partnership. The annual program, used to be called the Visit Davao Fun Sale, is initiated by the Department of Tourism, the local governments in the Davao region, as well as private sector stakeholders such as the Davao Hotels and Resorts Sales and Marketing Association, Restaurant Owners Association of Davao City, the Visit Davao Tours Consortium, the MICE Organizers Ventures Davao, and the Davao Wellness and Spa Association. As part of the ten-week for VDSF, Cebu Pacific is flying-in top adventure travel bloggers and digital influencers from Singapore and the United Arab Emirates to experience the culture, sights and sounds of Davao City and the neighboring areas of Sta Cruz, Davao del Sur, the Island Garden City of Samal, Davao del Norte, Mati City, Davao Oriental and Compostela Valley. This year, the established partnership will continue to promote Davao and surrounding areas in Southern Mindanao as safe, enjoyable and exhilarating travel and adventure destinations for tourists – both local and foreign alike. In 2017, Cebu Pacific flew over 2.6 Million passengers, representing roughly 12% of the total 19.7 Million flown during the entire year. Cebu Pacific also brought in media groups, content creators and digital influencers from Shanghai, China, South Korea and Singapore, in partnership with several tourism establishments. Also Cebu Pacific is said to have brought over 15,000 tons of cargo to and from Davao like whole tuna, tuna products; as well as fresh fruits like pomelo, mangosteen, mango, lanzones among others last year. The extensive route network of Cebu Pacific in Davao has provided faster and more efficient means to move goods across the country. “Davao and adjacent provinces have so much to offer tourists—from thrill-seekers to laidback travelers; families on vacation; barkadas on a getaway and even solo backpackers. We want people to spread the word and dispel any notions they may have about Mindanao in general. 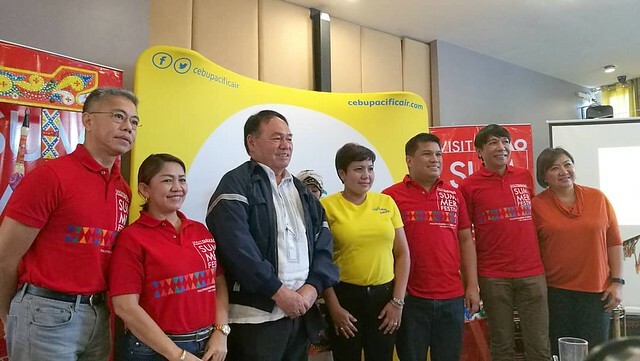 We strongly feel that positive word-of-mouth is integral to promoting the region, especially for foreign tourists,” said Charo Logarta Lagamon, Corporate Communications Director of Cebu Pacific. Cebu Pacific mounts over 148 flights per week to and from the Davao City International Airport, representing about eight percent (8%) of the total number of flights mounted weekly. Cebu Pacific has a fleet of 62 aircraft with an average age 5.03 years—one of the youngest in the world. The CEB fleet is comprised of one (1) Airbus A321CEO, 36 Airbus A320, 8 Airbus A330, eight (8) ATR 72-500, and nine (9) ATR 72-600 aircraft. In the coming weeks, Cebu Pacific will take delivery of an additional three (3) Airbus A321CEO aircraft, with another three A321CEOs arriving in the next several months. From late-2018 until 2022, Cebu Pacific expects delivery of 32 Airbus A321NEO (New Engine Option). The new aircraft, which amounts to a total investment of over US$5 Billion, supports Cebu Pacific’s expansion plans across the Philippines and the broader Asia-Pacific region, further boosting a network that now spans over 106 routes on 37 domestic and 26 international destinations. They are also strengthening their commitment and support in promoting the region as a good destination for the leisure and MICE or Meetings, Incentives, Conferences, and Exhibitions tourist markets.